I have always wanted to make homemade granola – and I honestly have no idea why I never actually tried previously. Maybe because granola recipes often have a TON of butter in them. Or a TON of sugar. Or because I never thought I would actually eat as much granola as I would be making in a whole batch… or I was worried that I WOULD eat the entire batch. Regardless, moral of the story is that I am a granola nube. But through a little recipe testing, I have come to realize that homemade granola is not something to be afraid of! 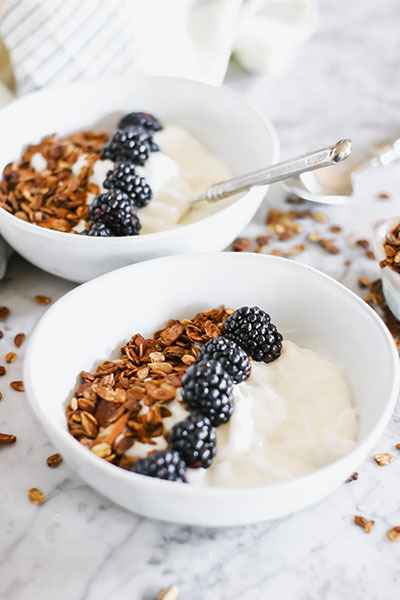 This Healthy Homemade Vanilla Almond Granola proves that! Old fashioned oats, almonds, sunflower seeds, maple syrup, brown sugar, cinnamon, vanilla, honey and a little coconut oil – VOILA! 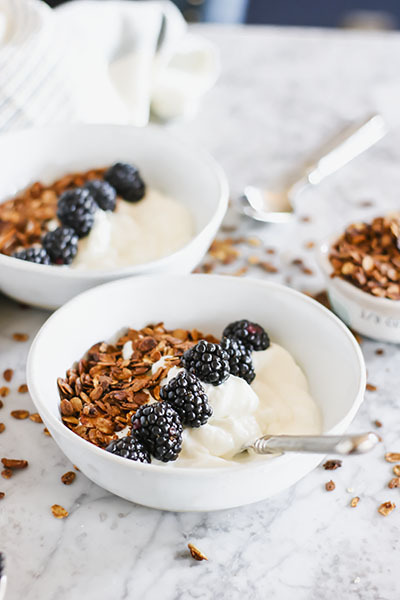 Delicious, healthy, homemade granola! Tasty and full of hearty ingredients! How do you eat your granola? As a snack on its own? With yogurt? Cereal? You really can’t go wrong. But one of my secret, FAVORITE uses for granola is over ice cream! Yup – you read that right! Sweet vanilla or cinnamon ice cream tastes amazing with a little extra granola sprinkled on top. Back home in Massachusetts, there was a great little quick service restaurant called Cafe Kushco that I always went to growing up. The food was good – sandwiches, salads, soups, a pretty traditional bistro-type restaurant. But that’s not why we went. We went for the ICE CREAM! When you went, you got to pick your base flavor (chocolate, vanilla, or dairy-free) then you pick a topping! Or two! Or five! Then they had this incredible machine that blended the ice cream and your chosen toppings into a new flavored ice cream! I know what you are thinking – sounds just like a McFlurry or a Blizzard. But this machine blended the ice cream way more than those desserts! Instead of feeling like you are having vanilla ice cream with oreos, it really tastes like you are having cookies and cream ice cream! Comprende? So what does this have to do with granola? I used to always get my ice cream with cinnamon and granola – it was A-MAZE-ING! And the best part? THEY DELIVERED! What is better than delivered ice cream? Seriously? Maybe delivered cookies and ice cream… But that is about it. 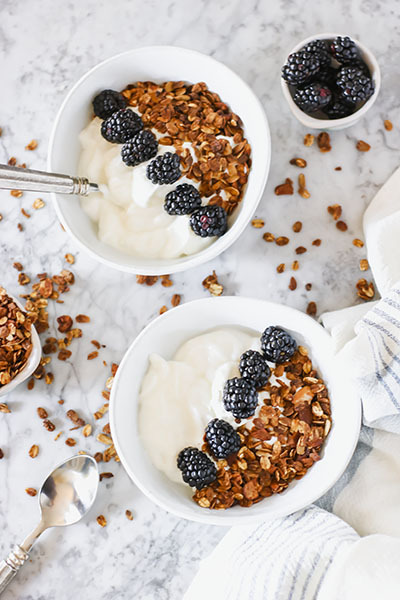 I tried to make this granola the right combination of tasty and healthy. 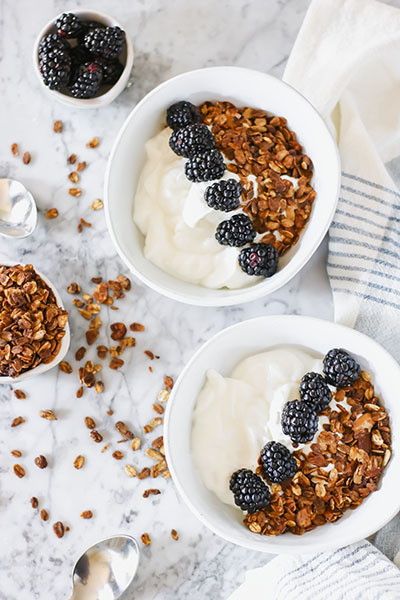 Many granola recipes are loaded with butter – seriously, loaded. And while they taste incredible, they really aren’t good for you. I wanted to make a granola that you didn’t have to feel guilty about having. Ya feel? 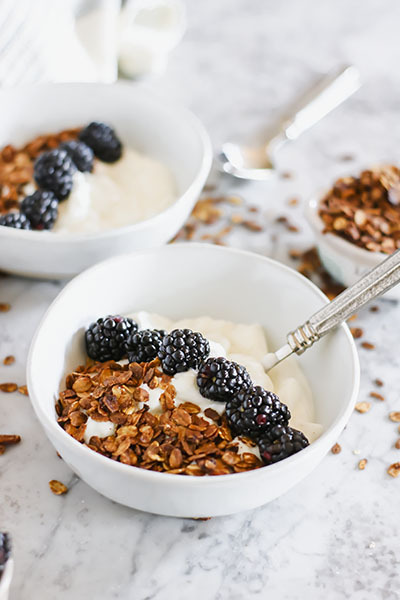 Because this granola is LIGHT on fat (only 1/4 cup of coconut oil, or butter if you choose to substitute), it will be a little bit dry! If you would prefer a more indulgent granola and don’t care as much about the calorie count, I encourage you to double the fat content. Just watch your granola in the oven because it may cook a little bit differently than my suggested times below. 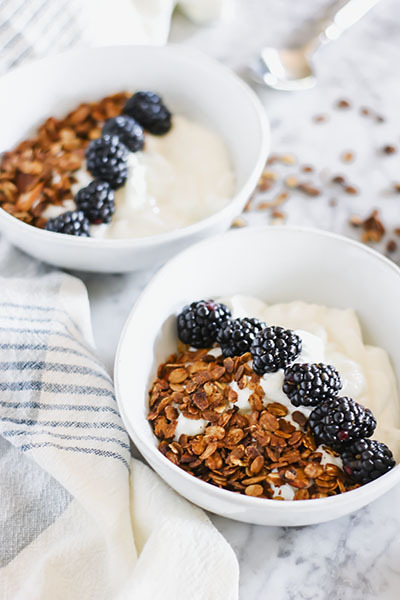 Seriously though, how beautiful do these yogurt bowls look? I am getting hungry just typing this. 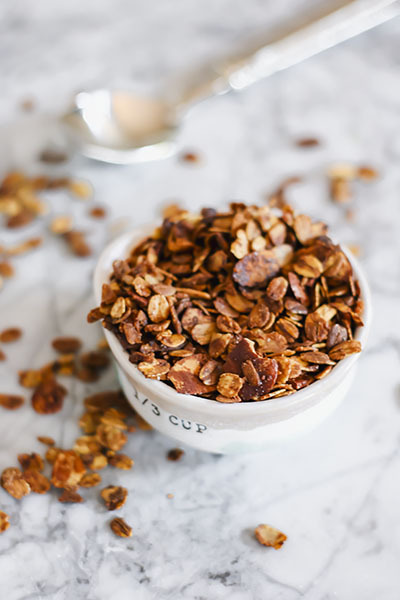 This granola is fab because it will stay fresh in an airtight container at room temperature for 1-2 weeks! AND you know exactly what went into it! No chemicals or preservatives – just delicious, whole ingredients (plus sugar 🙂 of course). Sometimes I like my granola extra crunchy so I will top my yogurt right before enjoying it. But other times I like to make a little baby parfait the night before… boy oh boy is that good. The oats soak up some of the yogurt, almost like in your overnight oats, but still remain crispy – YUMMMMM! And the fruit gets a little bit juicy, releasing sweet delicious fruity flavor into the yogurt. Its so good. I love to use blackberries, strawberries, or banana – but blueberries and raspberries are also great! If you are using plain yogurt, feel free to top with a little extra honey or even a swirl of peanut butter! YOU DO YOU! But most importantly, ENJOY! 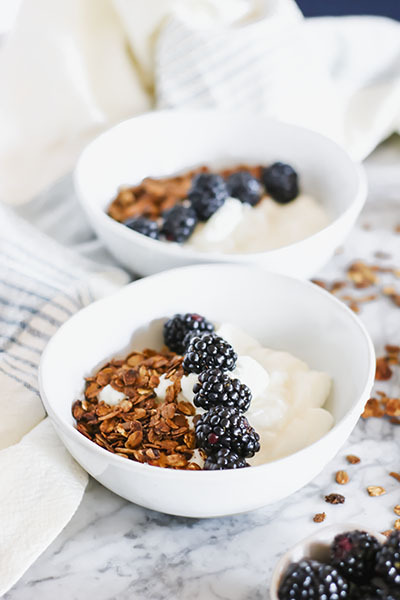 Crispy crunchy and light - this Healthy Homemade Vanilla Almond Granola is the perfect addition to your morning breakfast or afternoon snack. Preheat oven to 325F. In a large bowl, combine all dry ingredients - toss to combine, set aside. In a small bowl, combine wet ingredients - whisk to fully combine. Pour wet ingredients over dry ingredients, toss to fully coat. Use either a silicon baking mat or parchment paper onto a baking sheet, then spread granola mixture out across pan. Bake for 25-30 minutes or until granola is slightly browned, turning the granola every 10 minutes so that it does not burn. Remove from oven and allow to cool. Serve over yogurt or enjoy alone as a snack! Storage: Store granola in a cool dry place.